So, we've finally gotten behind the wheel of the new sixth-generation, all-wheel drive M5. It has 592bhp - four times the power of the entry-level Five and a 0-62mph sprint time of 3.4 seconds - just as fast as its main rival from Affalterbach. 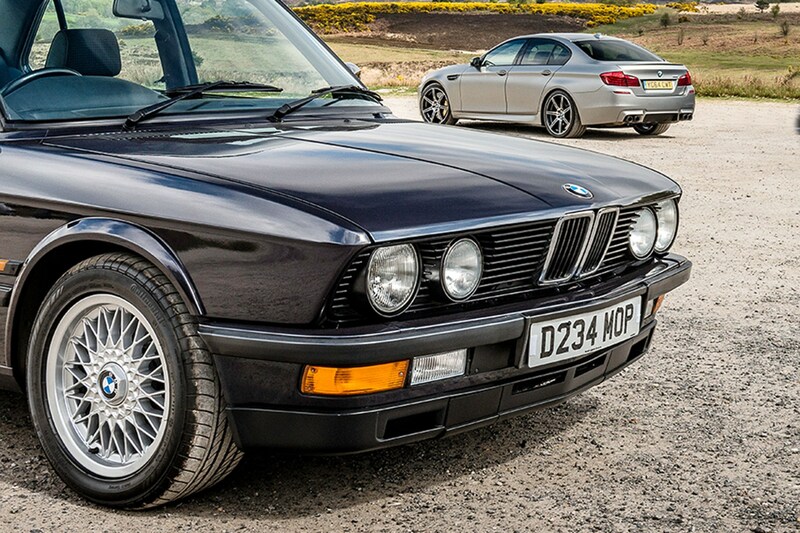 If that sounds outrageous, it’s actually business as usual for the definitive super-saloon: in 1985, the first M5 made 286bhp, more than tripling a 518, edging out the new Ferrari 328. The badge still promises much the same as it always has – discreet high performance, long-distance comfort, plus a side helping of oversteer – but the M5 has delivered its numbers with surprising diversity. 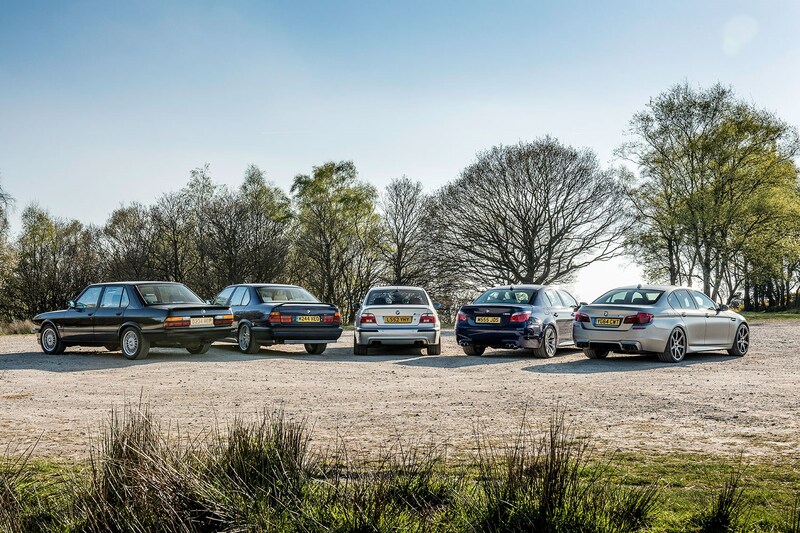 To understand its legacy, we’re visiting specialists Munich Legends, driving the last five M5s, and getting the lowdown from the experts who maintain them day-in, day-out. At a time when we’d adjusted from three-box Ford Cortina to jellymould Sierra, that first hand-built M5 must’ve looked retirement-ready, but its boxy lines are superbly evocative today. Badging removed, unadorned by the optional bodykit, it’s left to the 16-inch alloys and sawn-off-shotgun tailpipes to bring the visual menace. 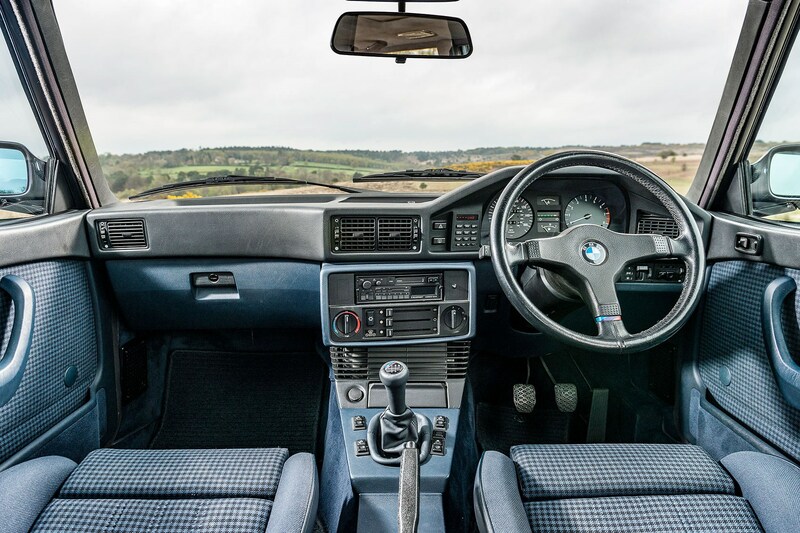 The interior is similarly subtle, if offering more clues that this is something special: the red, purple and blue M tricolour on the three-spoke leather wheel, gearknob and seats; the 6500rpm rev counter and 170mph speedo. You quickly feel at home: the straight six idles smoothly and responds eagerly to every tickle, and the checked fabric seats give slightly under your weight, the bolsters’ contours moulding around you. Pull back on the swan’s-neck gearlever, and you notice the shift’s long throw but also its perfect buttery resistance, how the pedals were set up by people who’d heel-and-toe to work, that the steering crackles with nuance. The E28 feels flexible rather than fast at first, but the straight six takes on a harder mechanical edge from 3000rpm, the warm bassiness transitioning to a fizzy top end. The fuse is already lit, and by 4500rpm it’s found the gunpowder, the mechanical meshing more intense, dominating the cabin, that last run beyond 6000rpm a rasping blur. As you press on, the dead spot at the top of the steering expands, so too body roll over the front end, and the leaden feel of a brake pedal that does very little. It’s discouraging at first, but you learn to make broader brush strokes with your inputs, cutting through the vagueness to feel the detail beneath. With the engine singing and chassis working hard, the E28 comes alive, 250lb ft, soft suspension and modest tyres helping it slide far more fluidly than any E30 M3. Fabulous. Appeal to businessmen means virtually all M5s have interstellar mileages, so you’ll probably have to accept 120-130k miles. Just 187 were built in right-hand drive, so don’t be picky. Buy the best you can afford/find, then budget for work – assume some will need doing. Make sure the M88 engine’s timing chain has been replaced at 100k miles. Get it inspected before you drive off if you don’t know it’s been done. The E28 M5 was available with an optional bodykit, but it can warp with age. Stealth bodywork is cooler. Judge that difficult-second-super-saloon (aka E34 M5) by its album cover and you’d expect a sleeker, more grown-up, slightly bloated E28. Correct. 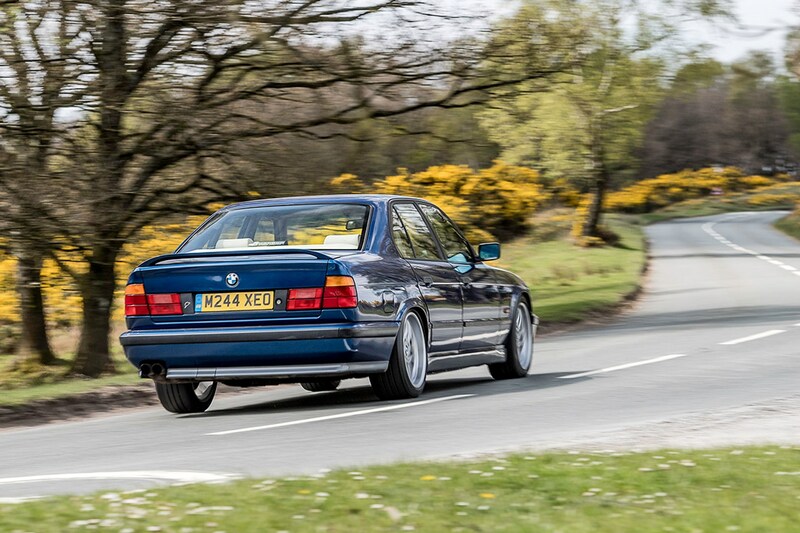 The only M5 to incrementally evolve its predecessor, the E34’s longer body is more streamlined; the wheels increase from 16 to 18 inches, the weight by a morbidly obese 240kg. 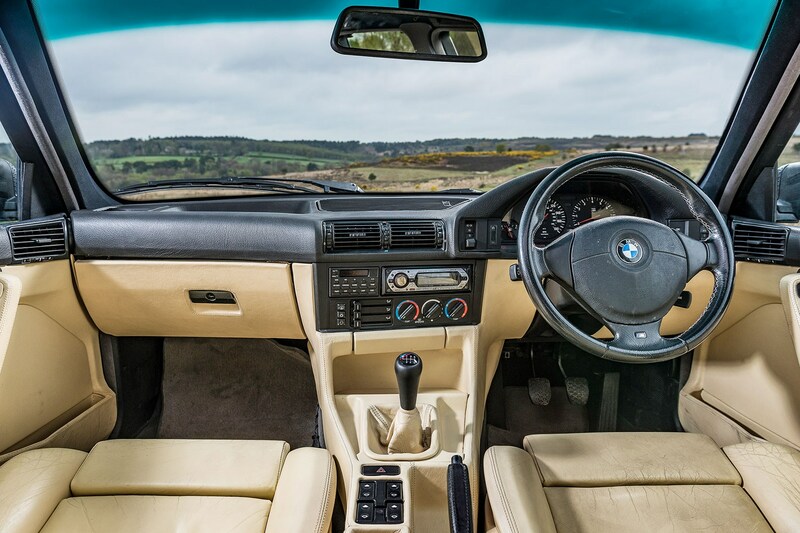 Inside, the dash architecture remains – centre console angled towards driver, passenger side scalloped – but there’s a greater distance between dash and windscreen, and the E28’s slimline steering wheel swells for a chunky airbag. Power rises to 342bhp, delivered 400rpm higher up the rev range than the E28, and variable-length inlet tracts boost low-down torque, giving 295lb ft @ 4750rpm. The overall character (low-down bass, high-rpm zing) is similar, however. Heavy vibration from the rear of this customer car unfortunately discourages adventurous behaviour, but you notice the steering’s tighter on-centre definition if more muted feel, the more progressive brake pedal, and the grittier, less tactile action of the six-speed gearbox. Body roll is nipped in the bud much more quickly than in an E28, but it feels significantly heavier, and the ride is busier; this car has the then-new electronic damper control, but the two calibrations are either very closely aligned or broken. Both 3.6 (315bhp) and later 3.8 (342bhp) engines available. Hand-built and tricky to tune precisely. Only 1994-on models get a six-speed manual. With E34 values still low, owners often take short cuts with maintenance. Expect huge mileages. Electric damper control standard on 3.8-litre cars. Expensive to replace, owners often replace with conventional dampers. 891 touring models were produced from 1991, all left-hand-drive 3.8s. Cecotto, Winklehock and 20 Jahre special editions in lhd, but only the Limited Edition in rhd – 50 made, with interior upgrades. Nürburgring package with upgraded dampers, Servotronic power steering, thicker anti-roll bars, wider rear tyres. 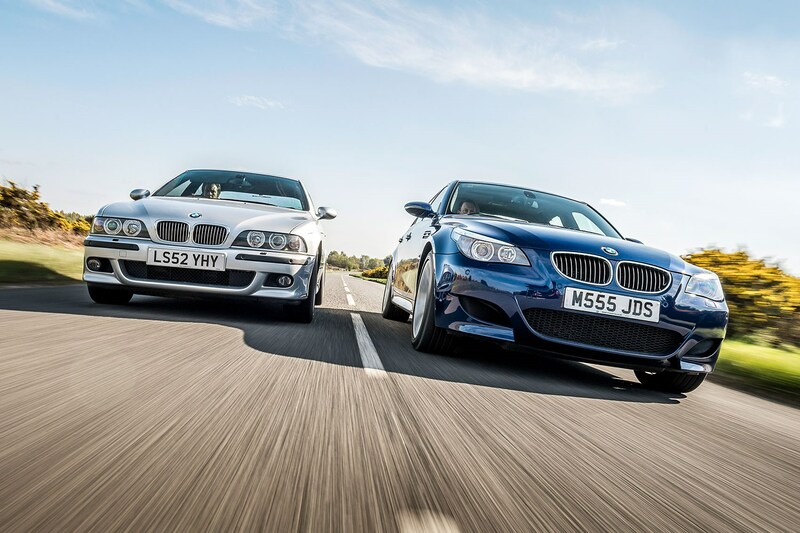 E34 production ended in 1995, the last of the hand-built M cars, and the last M5 with a straight six. The badge wouldn’t return until the E39 of 1999 (the silver car on the left in the picture above). When it did, semi-trailing arms were replaced by a sophisticated multi-link rear axle; shotgun twin tailpipes by wheelbarrow quads; mandatory opposite lockery by M’s first stability-control system. 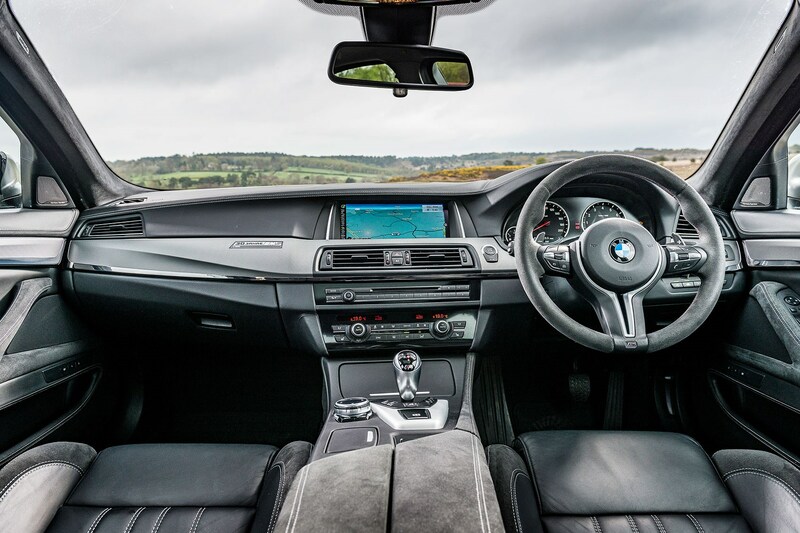 Inside, the leather seats are snugly comfortable, the driving position and pedals perfect, the layout surprisingly modern: a multi-function wheel; infotainment screen; lights on the rev counter that progressively extinguish as oil temperatures rise. Crucially, M’s first V8 is up ahead, 5.0 litres of naturally aspirated heaven. Power climbs to 395bhp, but it’s the torque that’s truly transformative, shading the E34’s 295lb ft at 4750rpm with 369lb ft at 3800prm, and just 50kg extra to lug. Blip the throttle at idle and there’s an instant bark of response and convulsive rock from the body. Yet at cruising speeds there’s a laid-back flexibility, a pleasing physicality to the controls4 that stops well short of obtrusiveness, a rich, smooth exhaust note, and a pliant ride that’ll lull kids to sleep in minutes. It’s more effortless if still true to the Jekyll-and-Hyde schizophrenia of early M5s. Drive hard and the intensity builds exponentially, as the V8’s lazy muscle-car demeanour snaps to attention. The revs soar as you push past 4000rpm and the trademark metallic rasp hardens to a snarling blare, until everything distils down to the speed you’re amassing. A sub-7000rpm power peak might sound a little stingy, but there’s real reward in holding out for the final goose-pimple 1000rpm, and it’s so much quicker than either E28 or E34. Despite the excess of power, the E39 chassis feels far from overwhelmed. There’s some body roll and pitch, but it’s tidily checked, and the front tyres bite hard on turn-in, grip telegraphed through a leather rim that’s firm immediately off-centre, if a little sluggish. 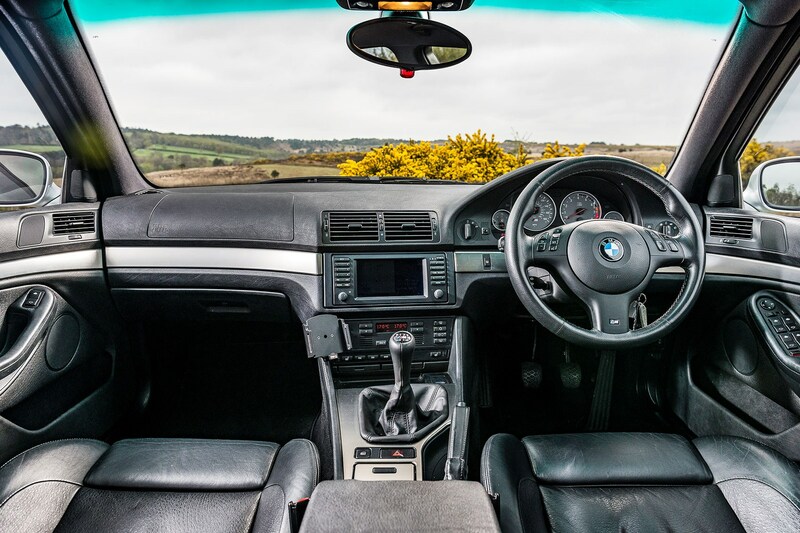 Combined with a generously long wheelbase and easily accessible torque, the E39 feels very rear-biased but easy to manage, even if its stability control is a bit health-and-safety. The V8 marked a big technological leap, and it’s common to have issues with lambda sensors and airflow meters. ‘It feels like a very robust car, but it’s actually quite delicate. Make sure you can afford to run it,’ says Munich Legends’ Dan Norris. The E39 doesn’t age particularly well, suffering bodywork corrosion and interior wear at surprisingly low mileages. Clutches can wear prematurely – the high biting point makes it easy to slur gearchanges, exacerbating the problem. In 2005, just two years after the E39 went off sale, BMW introduced the radically different E60 M5. It ensconces you in the best driving position yet, with even the shoulders of taller drivers falling well below the glasshouse, active bolsters squeezing your frame as g-forces escalate. The pedals don’t need to be perfect for heel-and-toe because the clutch is electro-hydraulically activated, the driver either controlling the seven-speed sequential gearbox manually, or leaving it in auto. There’s still plenty to keep your left hand amused/confused: a Power button to unleash maximum performance, three damper and ESC settings, and five gearbox shift calibrations. But it’s the amazing 8250rpm redline that makes you double-take. To play on its Formula 1 campaign during the V10 era, BMW slotted a 5.0-litre V10 in the M5; it makes a breathless 500bhp at 7750rpm and 384lb ft at a peaky 6100rpm, basically a Lamborghini Gallardo engine in a family saloon (or, later, estate). Weight increases by just 35kg; thank aluminium from the firewall forward. It delivers a significant shift in the M5’s character, bundling sensible Dr Jekyll into the back seats while mental old Hyde seizes the wheel. Even at a cruise it feels highly strung, the body control more resolutely tied down, the ride more jittery than before, the engine straining to be unleashed. At first those SMG gearchanges seem ridiculously ponderous and disappointingly unrefined; eventually you learn to ease the throttle during shifts, just like a manual. Better. The soundtrack’s distinguished by a rapid-fire, percussive gargle at low revs, the delivery a little torque-shy at the kind of revs where turbos now whoosh in. But at 3000rpm the scenery starts to blur, and the following 2500rpm is pretty intense, a higher-pitched wail quickly building. Mostly, you’ll shift by that point, because what happens post-5500rpm is insane, a kind of elasticity of velocity that continues to manically increase in rate long after you thought the crank would be banging on the canvas. Hold out for high revs, pull for the upshift, keep the throttle pinned and – thwack! – suddenly that ponderous gearshift is almost brutally instantaneous. Drive it like you stole it and the E60 makes sense. But with 19.6mpg and 344g/km – and a quick exit from Formula 1 – it soon didn’t. No wonder the next model came with a twin-turbocharged V8, its 28.5mpg and 231g/km almost as important as the launch-spec 552bhp/501lb ft.
From about 60,000 miles, big-end bearings and conrod bolts should be replaced to prevent total failure – some owners send off oil samples to check for early signs. While the bottom end is open, replace the Vanos system’s high-pressure oil supply pipe. Both throttle bodies can fail, at £700 each. With an induction strip-down required, it’s best to replace both. Budget £2k. The larger engine means pricier servicing: typically £300-£400, but £800-£900 every third service. The SMG gearbox is more reliable than hearsay suggests, but budget £1500 for a new clutch and flywheel every 40,000 miles. Drive hard and you get 8-10mpg and need a litre of oil every 1000 miles. ceramic brakes stop you like a knuckleduster (the standard stoppers are disappointing under hard use) and the ride on its Competition Pack suspension is firm, if offering an extra layer of pliancy over an E60. It feels tied-down and communicative. A twin-turbocharged V8 isn’t as exotic as a V10, but it’s extremely impressive. It makes 592bhp in this special edition – 40bhp up on the standard F10 – and 516lb ft at 1500rpm translates into much more low-rev flexibility. A foreboding rumble accompanies acceleration, and while there is fractional lag, throttle response is keen. It’s quick to rev too, and the way the blown V8 storms round the rev counter and shrieks with a deep, almost demented fury nearing 7000rpm properly captures the M Division spirit, while reinterpreting it with a darker, harder twist. 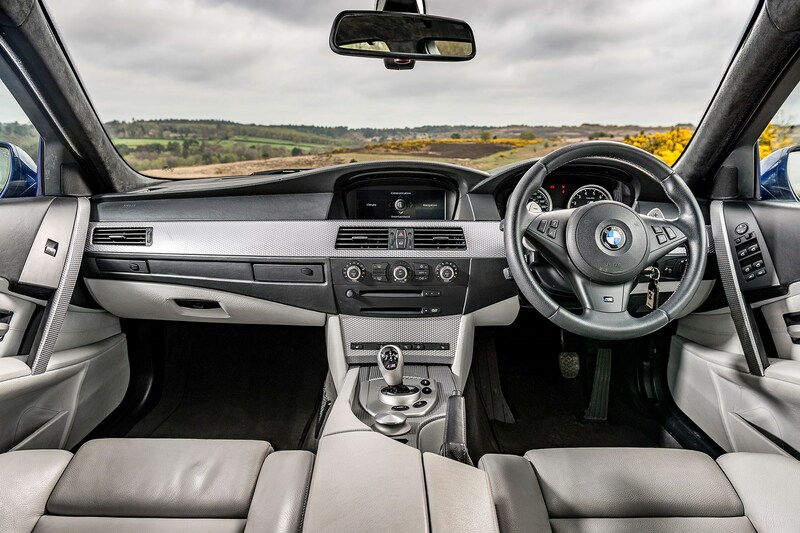 The F10 scores over its predecessor with its dual-clutch gearshift: refined if swift at a canter, it’s finger-click punchy in the most aggressive of its three modes (configurability is rationalised here, but still rules) for a never-ending stream of performance. Set all guns blazing and the F10 is eyes-on-stalks thrilling. Naturally it oversteers, but the way it grips and slips is quite interesting: the Michelin Pilot Super Sports can absorb a lot of provocation, and you have to push hard and constantly work against the grip, sometimes even in the wet. But on a dustier or greasier surface the torque wins, the F10 much more of a handful than its predecessors. You can understand why some owners crave extra driveshafts, but wasn’t stability control invented so we could all drive 600bhp super-saloons? After a day’s driving, I’d expected it to be tough to call which car I’d actually buy. But while I enjoyed every M5, it’s the E39 that has me clearing a space in the garage. Modern enough to feel usable, appreciating in value yet still affordable, fast but with old-school charm, and striking a perfect balance between comfort and tail-out kicks, it’s everything you could want from a performance saloon. 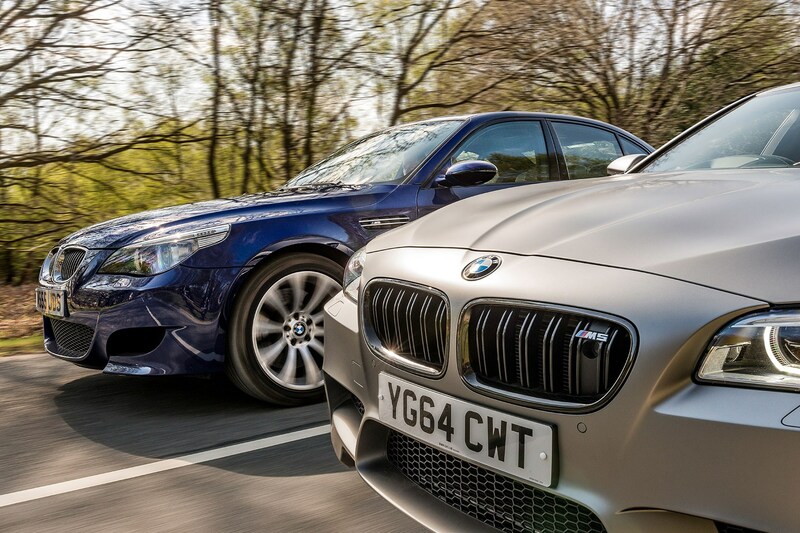 True to type, the M5 changes course dramatically this year, as you’ll have seen in this issue, with all-wheel drive now standard and many other differences. History suggests no M5 is to everyone’s taste, but the new one looks like a remarkable addition to a formidable lineage. Munich Legends report very strong reliability from the F10. Servicing should be no more than £400. Competition Pack option was introduced in 2013, with extra 15bhp, 10mm lower suspension with 20% stiffer springs and dampers, 10% quicker steering rack, 20in rims, and re-tuned diff/DSC. 30 Jahre model in 2015, just 300 worldwide. Essentially a Competition Package plus 15bhp and cosmetic niceties. Stock brakes are marginal for high-performance driving. Carbon ceramics optional from 2013. Disappointingly numb steering was improved with 2013 software tweaks, plus stiffer front suspension bushings and smaller torsion bar. And what about the latest M5 F90? Click here for our first official pictures story, and click here for Georg Kacher's track test of the prototype.